Universal Remote Control Inc. (URC) has proved once again that they are the masters of product enhancement. Their past history with multiple SL-9000 versions and the MX-500 sprouting into the computer programmable MX-700, makes it seems natural that the popular MX-500 design franchise would yet again be upgraded. Just as the MX-500 begat the MX-700, the MX-700 has now led to the $499 USD MSRP MX-800. Essentially the MX-700 remote control with added RF capabilities, the Home Theater Master MX-800 does have several other changes. First, the MX-800 does not ship with the tiny MX-200 remote control. In its place is a piece of hardware called the “MRF-200”. Despite the similar model numbers, the MRF-200 is not a remote control – it’s an RF/IR transceiver. 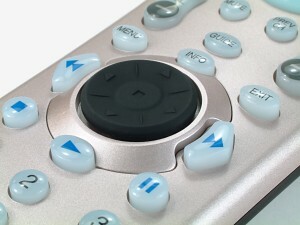 Secondly, Universal Remote has changed the MX-800’s exterior finish. The matte beige (okay, “sandstone”) coating on the top half of the remote has been replaced with shiny metallic platinum. Although no longer grippy, the new finish should solve a long-term use problem found with the lightly colored surface, where it would absorb skin oils and discolor around the edges and oft used buttons. 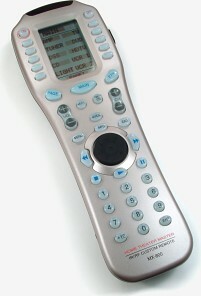 The bottom half of the remote retains the same pleasantly grippy texture as the MX-700, but in black – the darker color hides any discoloration that may occur here. Another cosmetic change is the 5-way menu pad. Previously beige on the MX-700, the MX-800’s pad is black, similar to the MX-500’s dark blue version. However, the transparent ring that originally encircled the pad and was illuminated via the backlight has been painted the same platinum color as the remote and no longer illuminates. This is disappointing, since I really liked how the ring highlighted the menu pad’s position in a dark room. The backing color of the LCD is also different, less yellowy and more greyish. Otherwise, the MX-800 is physically identical to the MX-700 – same keys, same button finish, same great screen contrast, same IR emitters, same annoying bump for the serial port. Control what you can’t see. The MRF-200 RF device is not designed to operate actual radio frequency equipment. Instead, it rebroadcasts RF signals sent from the MX-800 remote control as infrared. So, if your equipment is stored behind wooden doors, off to the side, or even in another room, the MX-800 can still be used for control. Measuring 5.1” wide, 3.5” deep and 1.2” high (13.0cm by 8.9cm by 3.1cm) with the antenna folded flat, the MRF-200 is very compact and won’t take up much room. It’s also finished identically to the remote control in platinum and black, so left out in the open it will be complementary. The MRF-200’s semi-flexible antenna is about 3.5” long (8.9cm) and can be adjusted for best performance no matter where the transceiver is situated. A plastic mounting plate (screws included!) slides onto the bottom of the unit and can be used to place the unit in gravity-defying locations. Also on the bottom are four soft plastic feet for tabletop use.